Collective action at all levels and balanced multi-stakeholder participation are prerequisites for generating more sustainable solutions. 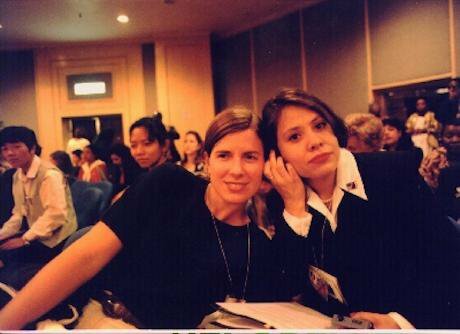 Participants in the Fourth World Conference on Women share a headset to listen to the proceedings in Beijing, China in 1995. UN/DPI 061727/Chen Kai Xing. All rights reserved.Participation of citizens in deciding their future is fundamental to achieving inclusive societies and is a critical element of the 2030 Agenda for Sustainable Development. With 17 Sustainable Development Goals (SDGs) at its core, the Agenda ­– which was adopted by 193 countries in 2015 – set out a plan of action that seeks to end poverty, combat inequalities and protect the environment in all countries. It aims to achieve development in an integrated way – economically, socially and environmentally – that meets the needs of present generations without compromising the ability of future generations to participate in the processes that impact their lives. Of these goals, SDG 16 specifically aims at building peaceful and inclusive societies, providing access to justice for all and developing accountable institutions, while ensuring participatory and representative decision-making at all levels. Since the adoption of the Agenda, countries have started using various foresight exercises to set their own national targets guided by the global level of ambition to meet the SDGs. One of the key imperatives for achieving inclusive and sustainable development is the reduction of inequality. Inequality is a multidimensional concept which is understood not only in terms of the distribution of income between individuals (‘vertical inequality’), but can also be found in political, social, cultural and environmental domains and may relate to inequality between groups (‘horizontal inequality’) characterized by gender, class, race, ethnicity, age or religious affiliation. Rising inequalities, both vertical and horizontal, have led to an upsurge in large-scale protests and social movements around the world in recent years. These protests have taken place in a broader context of democratization that has accelerated over the past three decades in many parts of the world, and has been accompanied by people’s enhanced ability to voice opinions with greater possibilities for accountability at regional, national and local levels. Many people today live in democratic states, and decentralization has been increasing, notably in India and several Latin American countries. Brazil and India, for example, have institutionalized citizens’ participation through their constitutions, which opens up space for people to participate in the formulation, management and monitoring of policies so that they better reflect citizens’ needs. Many governments have also used affirmative action policies to promote greater access of disadvantaged or underrepresented groups to public institutions and ensure the equal right to participation and representation of all groups. Caution, however, is needed as to how these policies are implemented as they can alienate other groups and thus run the risk of generating tensions. While citizens’ empowerment and participation has been growing, there has been deterioration in the quality of democracy in recent years, manifest in the failing traditional political party system, the growing disconnect between elites and ordinary people, and the rise of populist parties, notably in some advanced democracies. Between 2006 and 2016, for example, almost half of the 167 countries covered by the Economist Intelligence Unit’s Democracy Index registered a decline in their overall scores, with the biggest regressions observed in eastern Europe, North America and western Europe. In fact, the overwhelming demand of protesters in recent demonstrations has been not so much for economic justice per se, but for real democracy. While the legal foundation is an important mechanism to ensure people’s engagement in decisions that affect their lives, more effective approaches are needed to recognize the diversity, identities and abilities of local actors to participate in these processes and improve institutional arrangements that enable them to do so. Such processes of empowered participation may challenge existing structures and relations of power, yet they are crucial for both fair decision-making and equitable outcomes. More collaborative and participatory processes can in turn facilitate the mobilization of resources at the local level, pool competencies and create synergies that otherwise won’t exist. Gender equality and women’s participation in decision-making are critical to inclusive and sustainable development. Although overall gender gaps in political representation have narrowed globally, women continue to face disadvantages in participation in private and public decision-making. For example, women have gained ground in parliamentary representation in nearly 90 percent of 174 countries over the past two decades, with the average proportion of women in parliament having nearly doubled during the same period. Yet still only one in five members are women. Across all regions, women’s representation in leadership positions falls short of the global 30 percent target endorsed by the United Nations Economic and Social Council in 1990 and reaffirmed in the Beijing Declaration and Platform for Action in 1995. The main reasons behind women’s limited opportunities and abilities to participate in decision-making lie in persistent discriminatory laws and practices reinforced by deeply entrenched social norms and unequal power relations that prevail in many countries. Furthermore, women’s rights have not been adequately supported by institutional mechanisms such as financing or political commitment to gender equality. As a result, some of the structural issues that many women face, including violence or unpaid care and domestic work, remain unresolved. These challenges hinder women’s empowerment in economic, social and political domains and hold back progress for women, communities and countries. At the same time, while providing opportunities for political participation is important for women’s empowerment, it is not sufficient to achieve real gender equality. For example, women’s presence in the governance structures carries the potential to change discriminatory practices, but if the women in question are drawn from a narrow elite with no grassroots constituency to represent, their presence will be merely a token one. Unless provision is made to ensure that policy changes are implemented in ways that allow women to participate and hold policymakers and other relevant actors accountable for their actions, substantial gender equality and broad-based women’s empowerment is unlikely to be achieved. In this sense, women’s empowerment entails not only access and opportunities to decision-making but also the women’s agency or ability to make choices and decisions and act upon them in ways that challenge social norms and unequal power relations. In a world of interdependence, no country acting alone can fully manage the range and scale of risks and challenges that exist today. Multilateral engagement provides significant opportunities to tackle these challenges, which in turn depends on strong institutional frameworks and governance mechanisms that establish a foundation for the design and implementation of international collective action. Yet formal institutions of global governance are being challenged, both by global forces and by national movements. The complexity of today’s world means that all resources need to be utilised to ensure the inclusiveness of participation. Henceforth, it is essential to ensure that the poorest and most vulnerable populations, both in developed and developing countries, are able to exercise their rights, have their voices heard, and benefit from development gains. Public policy that purports to facilitate participation should be concerned as much with civil and political freedoms (such as the right to expression and collective bargaining) that enhance the capacity of disadvantaged groups, including women, to organise and mobilize, as with engaging civil society, community-based organisations and local people in decision-making processes. Meaningful broad-based participation should therefore be not only about giving disadvantaged individuals or groups a voice at the table; it must be about strengthening their capacity to influence decision-making processes and exercise their claims on external actors and institutions that affect their lives. While the future is impossible to predict, as multiple crises and disasters including volatility in the global economy and continued uncertainties and disruptions in people’s lives in recent decades have acutely demonstrated, there is a challenge – and also an opportunity – for a sophisticated policy response of preparedness, investment and cooperation. In this sense, foresight is a tool that can help governments, communities and people to better prepare for potential risks and identify strategic opportunities for new development pathways. Sustainable development can be achieved only if the development process is inclusive and participatory, placing people at its heart and involving a broad alliance of governments, international organisations, civil society, academia and the private sector, all working together to secure the world we want for present and future generations.